Maybe one of the more anticipated Black Friday sales, Apple has posted a preview of what will be on sale tomorrow. Just like in previous years Apple giving the biggest discount towards its higher end item, like the MacBook Pro, and the new MacBook Air. So far Apple has posted a total of 18 items for tomorrow’s one day sale. The one gift that everyone will be keeping an eye on is the iPad. Apple has put a $41 discount on the base model iPad. The prices will start at $458, instead of the normal $499. Both the MacBook Pro and the MacBook Air will be getting a $101 discount, which isn’t too bad. Apple also has some deals on their peripherals. You can look to save a modest $11 on a wireless iPad keyboard, if that’s what you’re in the market for. What we don’t know is what time the sales will start online. I’ve heard some rumors of a 9am EST start time, and I’ve heard a possible early morning start time. There is also a good chance that the Apple Retail stores will also have the same items on sale. 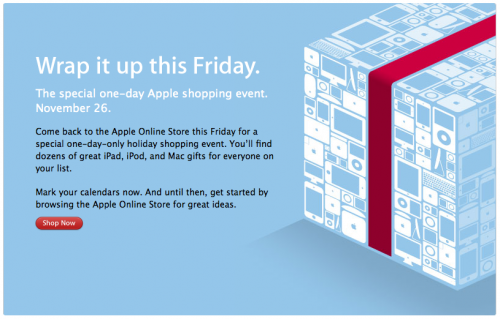 So if you’ve been waiting to buy that desirable Apple product, tomorrow might be the best day to do it. For a full list of what Apple has for sale, head over to the Apple Store online. Happy shopping!